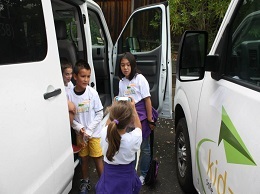 We provide pre-scheduled rides for kids of ages 4-17 at affordable prices. We strive to simplify the lives of parents by transporting children to and from various destinations, whether it be school, sports activities, tutoring services, you name it! We do not serve individual parents only parent groups with minimum of 6 students per ride share. Services are available for a school year contract with monthly payments. Please ask your school to join KidzJet ride share program. Please create or join an existing carpool. Once we have 6 students, we can start servicing the route, subject to availability. Join now by clicking here. Make reservation today and check out our competitive rates. You never have to worry about kids pickup and drop-off. Track your kids through our app. It's Safe, Reliable, and Affordable. We provide service for full school year.